Islamabad. 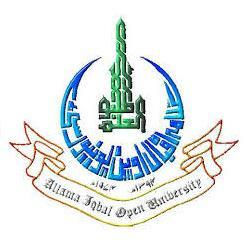 Allama Iqbal Open University Islamabad issued AIOU matric, inter, ATTC, CT, PTC and B.Ed date sheet 2018 for the autumn semester exams 2017. The AIOU semester exams 2018 will be started from 09-4-2018 and the final paper will be held on 13-6-2018. The candidates can get the detailed information regarding their AIOU SSC, HSSC, Diploma in Education, CT, PTC, exams date sheet online and the papers will be held in the evening time from 02:00 pm to 05:00 pm. The candidates are asked to appear in the autumn semester exams 2018 at the given schedule and the students will have to follow the date and time of all papers. The candidates receive the date sheet and roll number slips before commencement of papers so that they can follow all of the papers in the allotted exams centers.